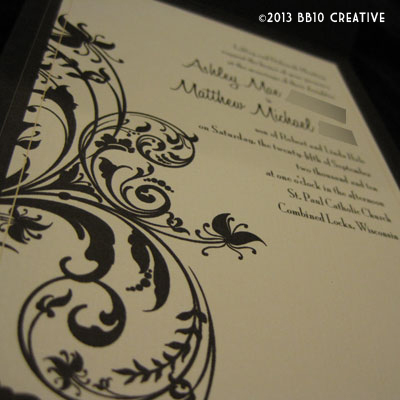 Ashley and Matt came to me as a referral from Rachel, my 2nd September wedding client. Ashely and Rachel work together and ended up having the same wedding date, and even have the same wedding colors – black and ivory! 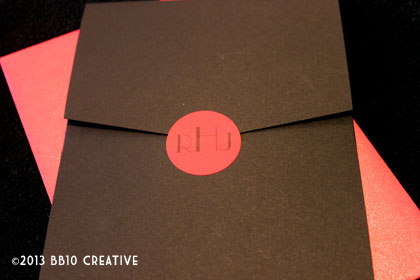 Black is definitely the color of September! 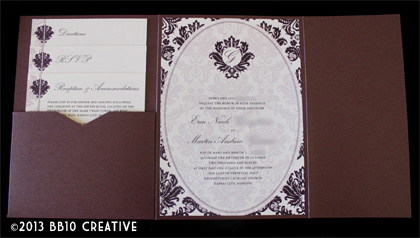 Ashley and Matt were looking for a more formal and traditional invitation, but also liked the idea of using vertical enclosures. 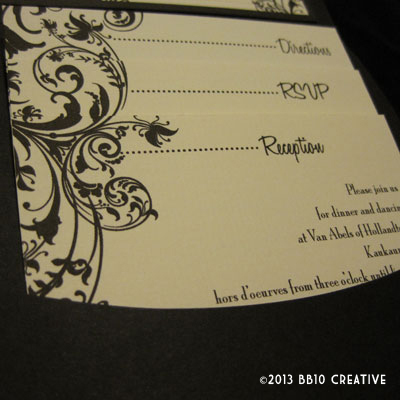 They also liked the idea of using an ivory paper versus a bright white, to help incorporate the ivory more into the invitation. 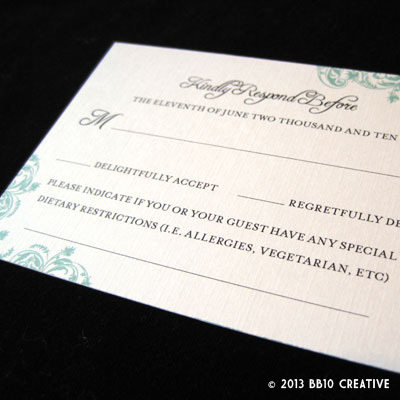 After being presented with the design options, they narrowed down the choices to this design. 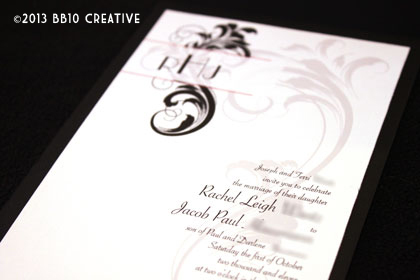 This design is more traditional, but uses a serif font paired with a more modern script, adding just a hint of modern flare. 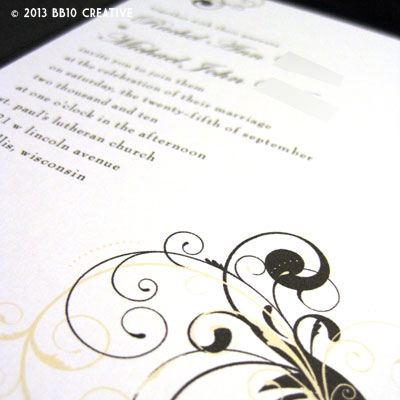 The dense yet elegant floral design almost has a damask-style quality to it, to me it almost feels as though it could have been engraved. 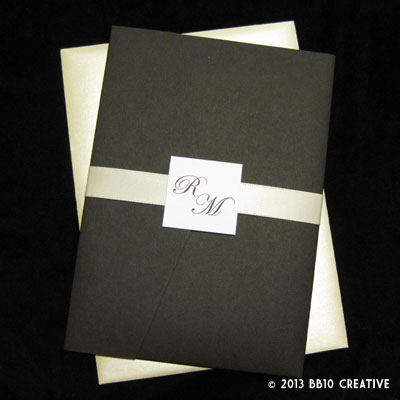 The couple chose a very pretty ivory textured paper paired with a black vertical enclosure and ivory metallic envelopes. The enclosures were sealed with a monogram sticker. 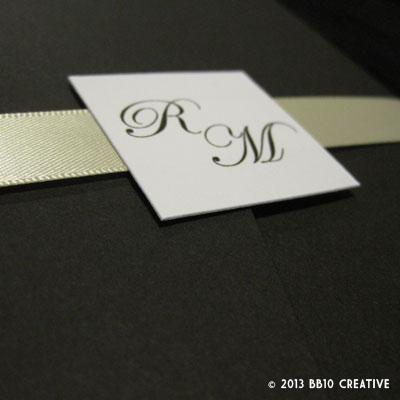 Overall the final package is really elegant. 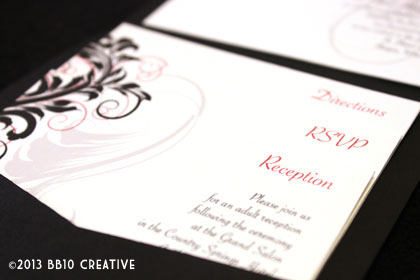 My favorite part of this invitation is how the floral element spills over onto each of the cards in the lower pocket. 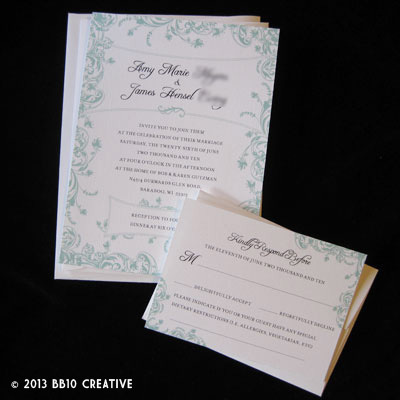 As always, I love how these turned out, and even though Rachel and Ashley have the same wedding date and colors, I am happy to say that I was able to help them achieve very different looks for their invitations. 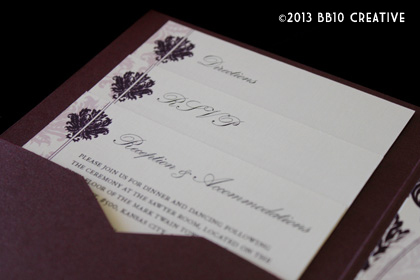 BB10 Creative stands out for that reason – each invitation is custom to YOUR wedding so no one will ever have the same invitation. 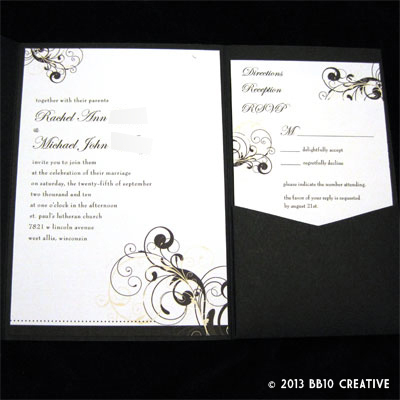 If you know someone getting married next year who is looking for a unique design, send them my way! 2011 is starting to fill up fast! 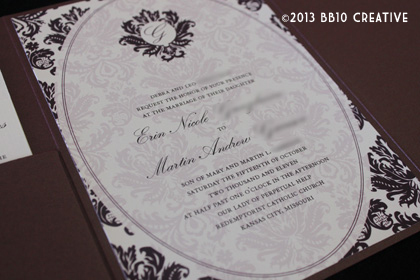 As always check back for updates on BB10 Creative and watch for our next post: Fall Wedding Number Four – Kari and Ed. Summer is finally here and love is in the air! 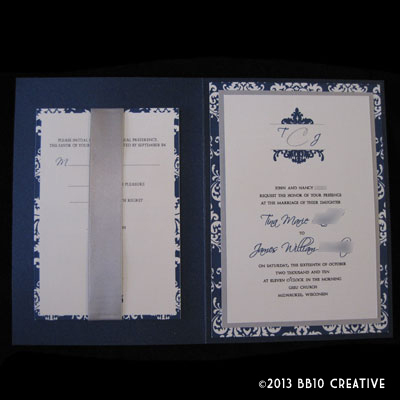 I had the privilege of working with a great couple, Amy and Jim, on invitations for their June wedding. 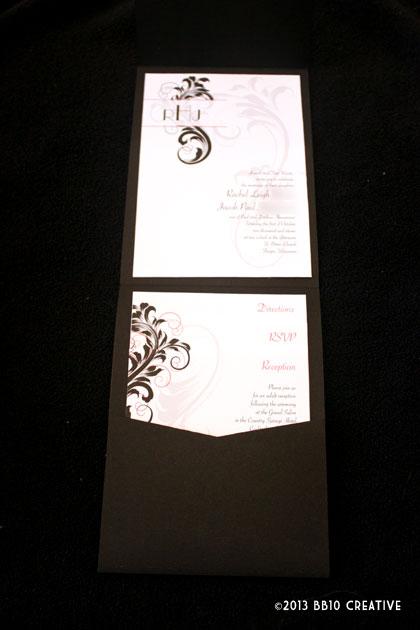 They were looking for something very simple, but elegant. 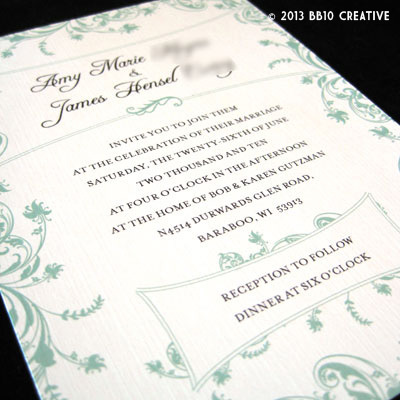 Amy had a small budget and a specific idea in mind that she wanted something with a vintage feel. 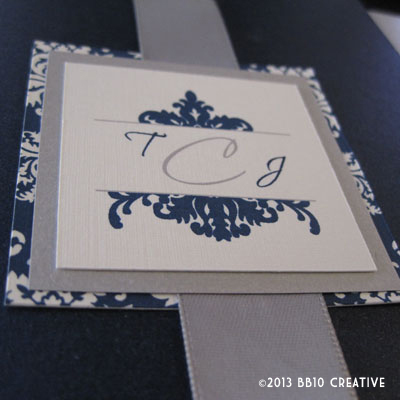 The resulting invitation uses a very elegant yet vintage looking floral scroll border in a robin’s egg blue. 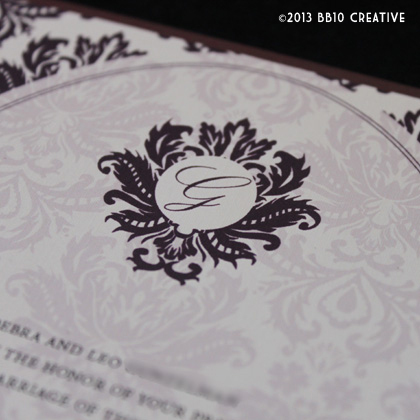 We used a very traditional sans-serif font paired with an elegant script to highlight the couples names. 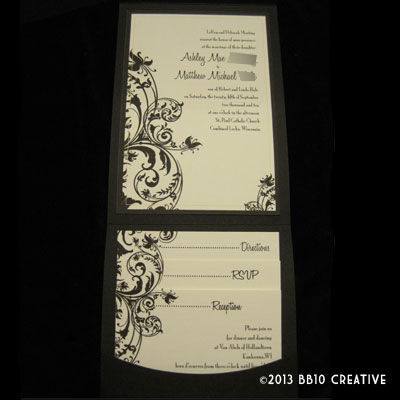 This invitation is unique for BB10 Creative because we normally use a lot of enclosures, but we were able to achieve a very clean and classic look with one invitation card, one RSVP card, and all white envelopes. 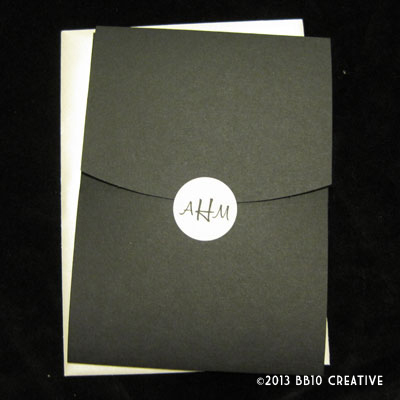 Amy chose to use inner envelopes to handwrite the names of guests, which helps add to that classic and vintage feel. 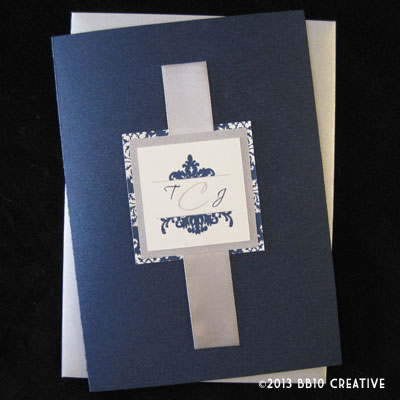 Check back often on BB10 Creative for new work and new blog postings. 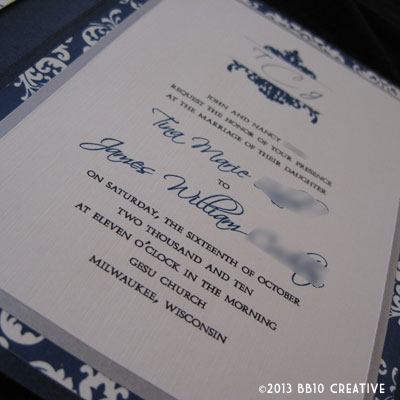 We have very busy fall season ahead with six weddings! Stay tuned and happy summer.